Ponedera is a municipality in Department of Atlantico, Colombia. It was founded on 23 November 1743. 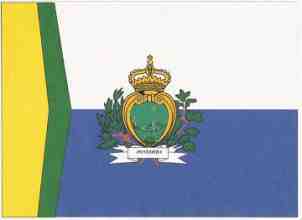 The flag of Ponedera is shown in the municipal web site. According to municipal web site, the flag is rectangular, in the statutory dimensions, horizontally divided white-blue with the municipal coat of arms in the middle. Two vertical, narrower stripes "pointing" to the middle of the flag, respectively yellow and green, are placed along the hoist. Blue is the symbol of the sky and water, water beingthe symbol of life and of the planet Earth. White is the symbol of peace and its virtues, purity, transparency and sincerity. Green is the natural representation of the agricultural work of our farmers. Yellow is source of wealth, life and joy. 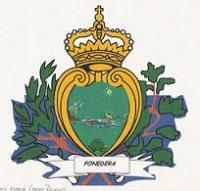 Coat of Arms: The coat of arms of Ponedera is made of a heart-shaped shield, green with a yellow border. The shield shows a fisher on a boat lit by the sun, a corn plant and a turtle. The shield is topped by a crown and surrounded by two leaved branches (the plant is not specified) with River Magdalena in the background, below the shield awhite scroll with the name of the municipality in black capital letters. The crown represents the patron saint of Ponedera, the Virgin of the Purification. The heart represents goodness and hospitality. The corn plant represents the main crop of the municipality. The sun symbolizes joy, life, luminosity and great power. The turtle recalls the etymology of Ponedera, lit. "a hatching site". The beach at the mouth of River Magdalena is a main hatching site for turtles, iguans and terrapins. The green branches recall the natural and cultivated environment of the municipality. The "Dream's Fisher" represents the c. 300 small fishers of Ponedera. The area dedicated to fishing (marshes, ponds and rivers) covers more than half of the municipla territory. Fishing is a potential main source of income but the fishers lack modern tools and the main fishing site, the Uvero marsh, is submitted to contamination, silting- up and erosion. The historical record of Ponedera does not include any evidence of a link with San Marino. Therefore, the similarity in the flags is either a mere coincidence or local plagiarism.